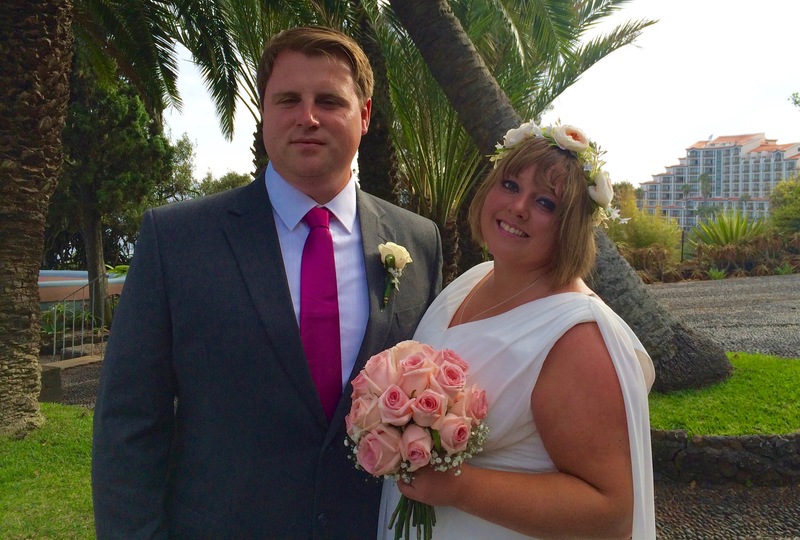 On the 22nd August 2016, at Reids Belmond Palace in Madeira, Laurence and Megan were married in an intimate ceremony with just Megan’s parents as witnesses. But even for intimate ceremonies, there is lots of planning that needs to take place. First the couple needed to choose a venue, and in Madeira, there are lots of amazing choices. I sent them some ideas, however, once they saw photos of the ceremony area at Reids Palace, they fell in love with it. Reids Palace are super organised and professional when it comes to weddings and they helped Megan choose the cocktail drinks, meal and organised the wedding cake and vintage car for the brides arrival. Then came the flowers. Megan had an idea of what she wanted and we spent an evening on-line sharing photos until we found the bouquet of her dreams. I was then able to send the photo to the florist and make the order together with button holes for the groom and her father. Now when you choose to have a small intimate celebration it is important to capture the celebrations with amazing photos, so that you can show all your family and friends back home. I booked for her, in my opinion, one of the best photographers on the island. Then came the time to start designing the ceremony. I sent both Laurence and Magen a questionnaire so that I could find out lots about the two of them, including some funny memories they shared. With this I was able to design them a beautiful ceremony which incorporated a speech from both the groom and Megan’s father. For music, rather than renting a full music system to play just a couple of songs for the ceremony, I lent her my Ipod Speakers and downloaded her music choices ready for the big day. So we were set and the day came. Everything went to plan and after the ceremony I left the happy couple supping their Pimms in the gardens. I made a little video for the couple as a wedding present. As the celebrant I was not able to capture the ceremony, but it gives you all an idea of the beautiful surroundings.